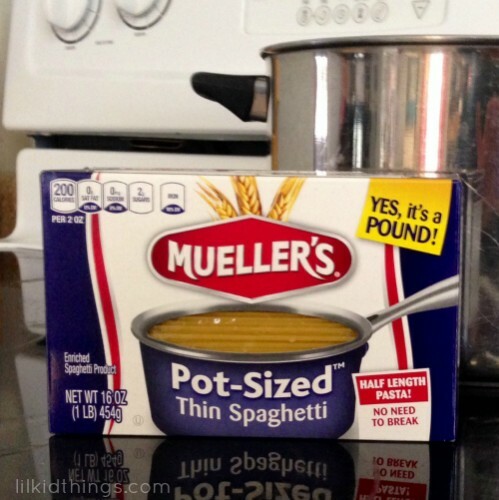 Home Lifestyle	Try Mueller’s Pot-Sized Pasta! With my big race at the end of this week, it should come as no surprise that I have carbs on the brain. More specifically, pasta! We love to make sausage spaghetti in our house and the kids are still small enough that I need to cut it up for them. I always start by breaking the spaghetti in half before cooking and then cutting it into smaller pieces with kitchen scissors after it’s done. It works for us and we all have a great meal. I recently learned that Mueller’s has come up with one of those solutions that makes you wonder why it took so long, called Pot-Sized pasta! It’s exactly what it sounds like and it’s awesome! It’s the same spaghetti, cut in half! If you are someone who loves twirling those long spaghetti strands around and around, this probably isn’t for you. But for my family it’s perfect. And what I love more is the boxes are smaller and much easier to store than long awkward boxes or bags of spaghetti. It’s a handy shortcut that I can appreciate. Have a kitchen shortcut that was a game changer for you? Mueller’s wants to hear it! From now until March 19th on Facebook, Mueller’s will be selecting weekly winners to win a $100 American Express gift card! At the end of the contest, the shortcut with the most votes will win a $500 American Express gift card! I know you have some brilliance to share so head over to Mueller’s and enter! I entered one of my favorite time (and hand) saving secrets into the contest also. 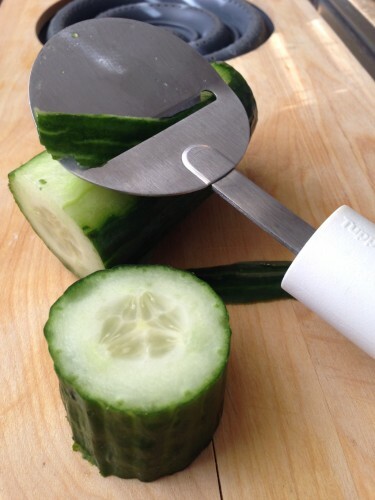 I can’t stand regular vegetable peelers so I have been peeling carrots, potatoes and cucumbers for years with my cheese slicer. The handle is bigger and I can cover much more ground with each swipe. In fact, I never even use it for cheese anymore. If you ask me, cheese should be consumed by the chunk anyway. If you like my shortcut, I’d love your vote! And there are incentives for voters too! Voting-up to once per day- enters you for a chance to win one of 6 weekly drawings for $100. If you enter, be sure let me know so I can vote for your shortcut! Have you tried Mueller’s Pot-Sized pasta yet? This post is part of a sponsorship with Mueller’s. All thoughts are my own.